The Edit Window is the main preview and editing area of the Motion Titler. This is where you rearrange, resize and rotate the foreground layers of your title. A necessary first step for most kinds of editing is to select the layer or layers your want to affect. Selected layers are drawn within a frame with eight control points for sizing and a rotation handle for rotating the layer in one-degree increments. Most types of layer can be “grabbed” for dragging to a new position by clicking anywhere within the control frame. Rotating a shape object within the Edit Window. The smaller arrow to the left of the mouse pointer is the rotation handle for the layer. To rotate a layer, click down on its rotation handle and drag. With text and shape layers, some of the layer content may appear outside the control frame. This occurs if one of the “details” within the look is defined with a horizontal or vertical offset that moves the detail away from the nominal location of the layer. The operations described here are for a single layer, but can be extended to work with multiple layers simultaneously. See Working with layer groups for more information. To select a layer in the Edit Window, click it with the mouse. This causes the layer’s control frame to appear, ready for editing. Layers respond to mouse clicks anywhere within their containing rectangle (the rectangle shown by their control frame when selected). This means that you may not be able to manipulate a layer that is visible only because it lies beneath a transparent area within the rectangle of another layer. To perform any editing with the mouse in such cases, you should first hide or lock the upper layer(s) as described under “Working with the Layer List”. To move any non-text layer, click down anywhere within its rectangle and drag to the new position. To move a text layer, position the mouse near the edge of the layer’s control frame until you see the drag pointer (four-way arrows) appear, then click and drag normally. Clicking inside the frame, as you would do a non-text layer, would instead activate text-edit mode. See Working with text for details on working with text layers. To resize a layer but retain its proportions, click down on a corner point of the control frame and drag outwards or inwards until the desired size is achieved. 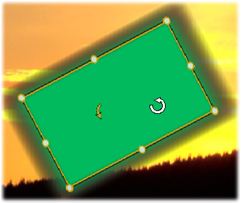 To resize a layer and modify its proportions, click a side point of the control frame and drag. By resizing with the center control point on two adjacent sides in succession, you can produce any desired size and proportion. To rotate a layer, click down on its rotation handle and drag. For finer control over the rotation, move the mouse pointer away from the center of rotation while dragging. The extra distance makes it possible to define smaller angles between one mouse position and the next. To change the stacking position of a layer, right-click the layer, and select from its context menu one of the commands on the Layer submenu: Send to Back, Send Back One Layer, Bring to Front, Bring Forward One Layer. Convenient keyboard shortcuts are available for all four operations; respectively, Alt+Minus, Ctrl+Minus, Alt+Plus and Ctrl+Plus. Another approach to reordering layers, which may be more convenient in titles where several layers overlap, is to use the Layer List. The Layer List also allows individual layers to be “locked”, making them temporarily immune from manipulation. Although locked layers display at their usual stacking depth, they do not interfere with the selection of deeper layers by the mouse. To delete a layer, select it, then – unless it’s a text layer – press Delete. Alternatively, you can use either of the context menu commands Delete and Layer Ø Delete Layer(s). Why have two delete commands? In the case of a text layer in text-edit mode, the Delete command (and the Delete key) apply to the layer’s text only. To get rid of the layer altogether, the Layer submenu command is needed (or its equivalent, the trashcan button on the Layer List header bar).